Gourmia 18-In-1 Multi Cooker Just $67.99! Down From $200! PLUS FREE Shipping! 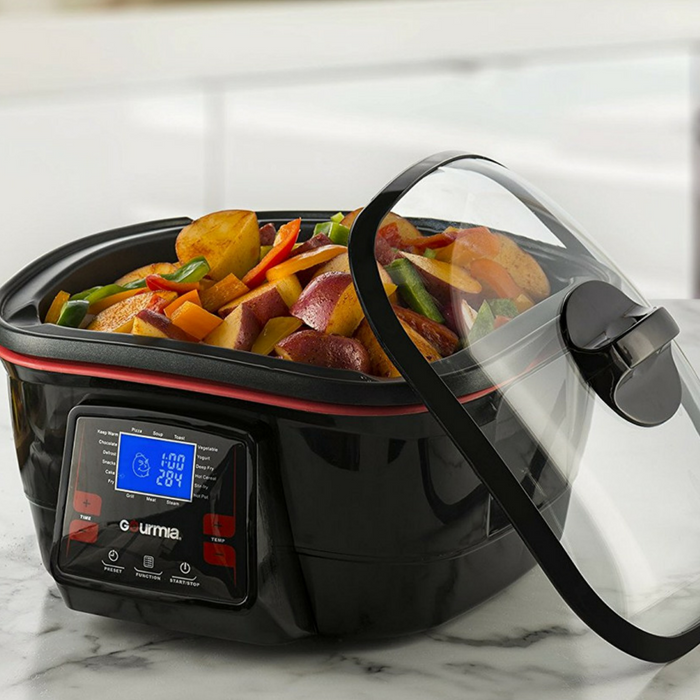 You are here: Home / Great Deals / Amazon Deals / Gourmia 18-In-1 Multi Cooker Just $67.99! Down From $200! PLUS FREE Shipping! Amazon has this Gourmia 18-In-1 Multi Cooker for just $67.99 down from $199.99 PLUS FREE shipping! Who says you need an extensive, complicated device & endless amounts of time to create gourmet & family favorites? The fact is all you need are your favorite recipes, and every smart chef’s latest secret do-it-all-device – the 18 in 1 AnyCooker Master by Gourmia. You will have an arsenal where even the most complex cooking chore is as easy as pushing a button! 18 IN 1 : LCD display with a huge variety of functions including; Grill, Steam, Fry, Soup, Yogurt, Pizza, and so much more! Choose a preset- or adjust your own your own settings of up to 10 hours and 465°F! NONSTICK POT: Do it all with just this one, versatile Multi Cooker. The tempered glass lid is clear for easy monitoring, and the 5.5 quart die cast aluminum insert is nonstick and removable. Easily wipe (or lick) clean. DELAY TIMER: Features a delay timer of up to 10 hours for advanced cooking ease, and a keep warm mode that ensures your dinner stays patiently piping hot until you’re ready for it! BONUS ACCESSORIES: Dishwasher safe accessories include a fry basket, steam rack, roast rack, and fondue skewers! Power cord is magnetic and removable. We even threw in a free recipe book to get those creative cooking juices flowing!